This J.O. Bundle Pack includes a J.O. Throwback Hat, Those Who Know Use J.O. T-Shirt, 2 Crab Mallets, a Crab Knife, 1 crabby words magnet, a lanyard, a 16 oz #2 Crab Seasoning, a 5 oz Garlic Crab Seasoning, a 4.5 oz #1 All Purpose Seafood Seasoning, a J.O. 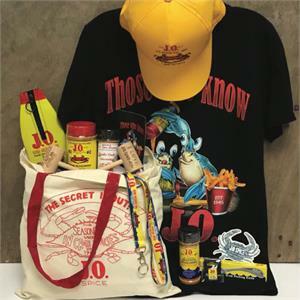 Pin, sticker, koozie and last but not least a Secret is Out Tote Bag.